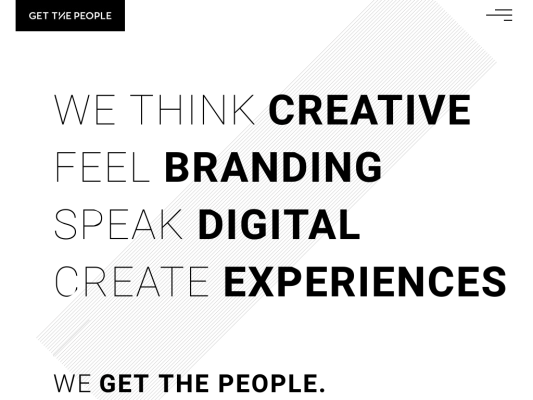 Get The People is a purpose-driven digital creative studio located in NY. We design and build digital products like websites and mobile apps for brands and people committed to making a positive impact through their products, tech, mission or services. Founded in 2011 by creative duo Rad Bratich and Megan Murphy-Bratich, we’ve partnered with some amazing clients ranging from emerging fintech startups to global lifestyle, fashion, travel, and social impact brands, helping them grow and connect with their audiences, or what we like to call – people. Our primary areas of expertise are in digital strategy, consulting, branding, website design, ecommerce solutions, mobile app design, development, among other digital services that can take you from vision to a fully interactive, mobile ready user experience that reflects your brand’s unique voice, style and vibe.